The interview discusses how a group of people will view sharks on TV differently depending on the type of music occurring in the background. When the music was light and flowing, the sharks were seen as majestic. Of course, when the music turned tense and frightful, the sharks were instantly seen as mindless killing machines. I’m sure this seems like common sense. However, I don’t think many people realize that our job as composers is to speak directly to the audience’s emotions, as much as possible! Let’s take a quick example from a rare documentary about John Williams composing for the original Star Wars trilogy (while heavily discussing Empire Strikes Back). In the clip below, we are shown the scene of Han Solo being frozen in carbonite – first without music, and then with. Notice the difference? As you probably noticed, without the music, the scene is a bit… “eh.” (With no insult to Lucas and team!) Sure there are some slight emotional points, and it seems like something pretty tragic and dramatic is happening. But when we hear the music’s elegant fluctuations from fear to uncertainty to hope and love then to pure evil, all within a two minute window… how could our emotions not run just as wild? The thing is, not many people realize when watching films or television shows, or even advertisements, how much the music is effecting them. The music doesn’t even have to be this grand orchestration we get consistently from John Williams either. The power of one note held out and twisted was Hans Zimmer’s trick for the Joker throughout The Dark Knight. The entire Joker thematic material is two notes. C and D playing back and forth with each other. The simple yet melancholic piano lightly played over a bed of soft sounds and textures brought a sense of wonder and awe to us, thanks to Thomas Newman during American Beauty. The lovely sounds of pitched percussion contrasted with out of tune synths and electronics to convey that not is all it seems between our two leads in Gone Girl, with the help of Trent Reznor and Atticus Ross. And of course I can’t leave out Michael Giacchino’s genius work in UP, where we see an entire marriage play out in four minutes and are left a sobbing mess by the end. Not a single word of a dialogue. The entire story is told through music and images. And it’s absolute perfection. Sometimes images are simply not enough. And I guarantee if music was absent from these scenes, whether you knew why or not, you would know and feel that something was missing. Composers are some of the hardest working people I have ever met. I’m not just saying that because I am one, I’m saying it because it’s true. They frequently work hours beyond a typical 9 to 5 job in pursuit of perfection in every aspect of their custom music. This goes not only for the actual notes of the music but everything involved with its creation: mixing, parameter automation, and MIDI editing. If I continued to list things you’d likely stop reading this due to boredom. I say this because there is value in the work of composers who create tracks for licensing and purchase to be used with different forms of media. While they might not be working to a specific film clip they are still creating an aural experience that can define a piece of work. It could even affect the media creator because they heard something specific in that track that made them want it in the first place! But just like any field of work with options, custom music has some advantages to pre-composed/licensable music. This is especially applicable to those of us who get to work in-house with a video team to bring their vision to life. Our team was recently working on a video that introduced a new award for the Triangle AdFed Addy Awards. The crew worked hard on the video to create something visually intriguing. While working on the music (using licensed tracks) something seemed missing. Luckily, I was asked to step in and compose something original to match the visuals! One of the things that wasn’t working for video producer Bryan Reklis was the lack of edge to the track. It was too clean and crisp for what we were trying to accomplish with the overall product. The lack of variety didn’t help either as the track had one tone throughout. While it worked nicely with the timing of the edits, it simply didn’t add anything else into the mix. This is where the advantages of working with a composer to make a custom soundtrack came in handy. The human interaction between two people working towards the same goal can have some surprising results. Having the ability to talk about what it is you want musically makes it easier for team members to integrate music into the project. The music is made specifically for their tastes and the needs of the project. This collaboration can lead to an even better version of what the video team and composer originally had in mind. Many licensable tracks also are created to have the same tempo and same time signature (number of beats in a measure of music) throughout the track. While this is very useful for editing, it can sometimes lead to redundancy. It’s not uncommon for video teams to purchase several pre-composed tracks and edit them together to form a Frankenstein music track with no consistency. With this in mind, I was able to create a track that had changes in time signature, tempo, dynamics, varying sections, and modulations to move the music forward in a 44-second window. Below I have attached a sort of “walkthrough” video where you can check out the Pro Tools session with the different instrument tracks and some of the parameters that were adjusted to keep the music moving forward while also serving the purpose of the advertisement. If you have music creators in your team, use them! We love the challenges that come with creating the track that fits just right. I hope you’ve enjoyed this walkthrough. We will have some new projects coming out soon that I’ve enjoyed composing for and I look forward to sharing them with you all. Usually when someone like Stravinsky, a man of immense talent and knowledge in the field of music, gives you advice you want to take it and apply it to your own work. Unfortunately, in this case, stealing ideas from songs/compositions will get you into some serious legal trouble (especially today). Take for example this recent event: Tom Petty has been awarded songwriting royalties for Sam Smith’s hit “Stay With Me.” Apparently people started to sing along to this song with lyrics from Petty’s “I Won’t Back Down” and realized they were eerily similar. It seems Tom Petty thought so too. Have a listen to this mash up and you’ll hear similarities in the chorus melody. What is the one common factor that has allowed these artists to have a case against another artist? The melody! Within music copyright laws you can not sue for someone using the same chord progression. If that were the case no one would be able to write a song destined for radio airplay (which is a whole other soapbox moment I may get into at a later date). The reason I bring this up is because in the world of marketing it is understandable that people will want a big hit song for their video. They might even want a number one hit for their on hold messages! With the cost of licensing fees and the consequences of not paying those fees if you use the track what is a smart alternative? A sound alike! Yes it is possible to have a song that sounds similar to the hit song you want but will avoid copyright infringements. Remember, the copying of melodic content is what will get you into hot water with copyright law. This does not apply to using similar instrumentation, gestures, tempo/song speed, or chords. The idea of a sound alike track isn’t new either. It has been used frequently in many mediums for quite a while. One of my personal favorite examples is the classic Animaniacs cartoon “West Side Pigeons.” Besides the title alluding to the great “West Side Story” you can hear how similar the music is to the work of Leonard Bernstein. The same ideas can be applied to any genre of music: pop, rock, indie, hip hop, etc. I will always try to advocate for creating original content BUT if you are in desperate need of something that sounds like the latest radio hit, yet can’t afford the song itself, a sound alike could be the answer for you. Do you prefer an original composition for your marketing content or do you think a sound alike track would bring in more attention and suit a production better? Let me know in the comments! My favorite commercial in the last several years comes from the “Big Game” of 2011. I’ve been a humongous Star Wars fan since my parents took me to see the films in the 90’s when they were being digitally remastered and shown in theaters again. If you’re reading this you probably know which commercial I’m already talking about. Volkswagen truly captured the same childhood imagination (and desire for learning how to control The Force) I felt at that age. I’d like to think I’m going to buy a car that can turn on with the press of the button in hopes to do this to my future children. Of course, who could forget the sweet story of friendship told in a minute time frame by Budweiser last year? I’m a sucker for anything with dogs in it but this is a legitimately beautiful piece of work. Sure I’m bringing this up because Sunday will bring commercials filled with humor and sincerity. But does this only have to be during one day of the entire year? Absolutely not! We take pride here at Blueforest Studios in creating content that is both engaging and informative. The most engaging way to capture the attention of your audience is to tell a story. We certainly think adding a pinch of humor also works too. So as the new year continues to roll on consider us for your marketing needs. We are storytellers that want to tell your story! Most days of the week, while working on sound design or composing music, I will have a moment when I reflect on how much the world of audio and music production has changed so quickly in the relatively short amount of time I have been in this profession. I remember upgrading from my old Gateway PC to a 2008 Mac Pro tower the summer before my junior year at Western Carolina. The prior year I had become friends with Jonathan Churchill, Co-Founder at Embertone virtual instruments here in Raleigh. When Jon first showed me his compositional works for video games the semester before I felt a switch going off in my head changing my desired course of future employment from band director to composer. My mind was boggled by the fact you could make such great sounding music from one computer! Growing up I always imagined everything had to come from a professional studio with millions of dollars of gear in it. Seeing Jon produce music from a Mac I told myself “I have to get one of those.” Seven years ago I also recall hearing the audio samples he was using and thinking “Wow, that sounds like a real orchestra!” Of course in that short seven years the quality of virtual instruments, analog modeled plug-ins, digital audio workstations, and everything in between has increased exponentially. And it’s only going to do so even more in the years to come. One of my favorite types of audio software to really come to light the last few years has been software geared towards audio restoration and repair. Now, there have been methods of reducing noise and crackle and various little messes here and there for a long time. Those are certainly all helpful and vital in achieving great audio for any medium of media. 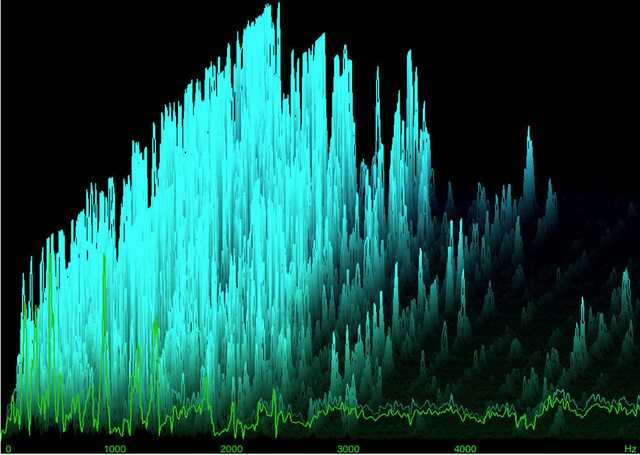 Within the last few years software such as iZotope’s RX line have given us ways to dive into audio from a spectral standpoint and remove just about anything you don’t want in your audio recordings. Anyone who has recorded audio on set for a film of any form will tell you there is quite a process to capturing the purest audio from the shoot. Being outside of a controlled environment there is a good chance that your microphones will pick up anything from car noises, to AC units, to wind, to chatter in the corner, and the list could go on and on. Luckily for us if those sounds creep into our recordings we can remove them and deliver the audio your video deserves! This tutorial video of iZotope’s RX software is a great demonstration of the difference even the slightest cleaning up of audio can do. Watch as the audio engineer is able to remove the noisy clicks from a wedding photographer’s camera during the vows of the ceremony. But what about the restoration of audio? Some clips may be too loud and distort during the recording process. While it is still in best practice to record at appropriate levels there also could be sounds a client would want to use that they have on hand that need to be repaired. Those types of recordings or sound effects can be worked with and polished too! Finally, in case you are saying “Dustin, that’s great but have you used anything like this before?”, here is a clip from a project I worked on earlier last year. This comes from a series of recordings done in the New York City metro system. Singer Pavlina Horakova and pianist Drew Spradlin came up with the idea to take a piano to the subway system in New York City and record different movements from operatic works of the past. I’m sure I don’t have to tell you a subway system, let alone the one in NYC, is filled with noise stacked upon noise with a little more noise on top of that. With a lot of determination, and several cups of coffee, I was able to not only clean up this recording of several extraneous sounds but was also able to repair several instances of distortion and clipping to hopefully bring you into the beautiful music these two performed. I hope all of you reading this have found it informative! Feel free to comment and let’s talk about the great things happening in audio and video production.